What’s the big deal? 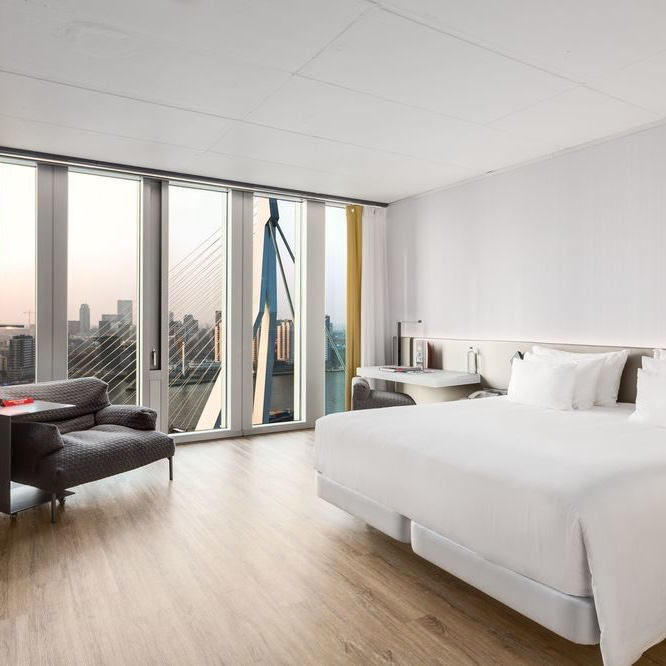 Nhow Rotterdam is just another architectural marvel — designed by none other than Rem Koolhaas’s OMA, of course — whose ultra-stylish interiors offer jaw-dropping views of Rotterdam’s beautifully restored waterfront, the city skyline, and the swan-shaped Erasmus Bridge. Ho-hum. Sorry about that — our editor has a rare medical condition that causes him to lapse into jaded hipsterism whenever he feels overwhelmed, as some kind of psychological defense mechanism. The simple fact is that the nhow, as they prefer we spell it, is overwhelming in all the best ways. 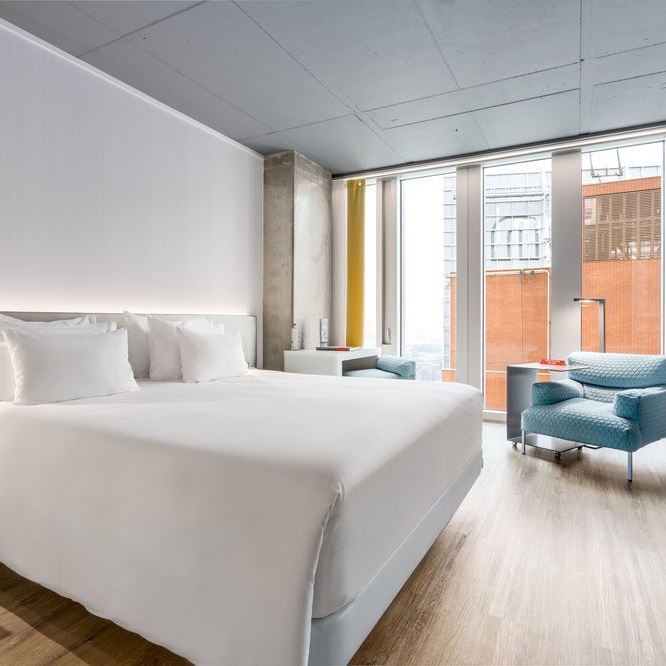 This is a hotel group whose design bona fides are very much in order, and they’re clearly no slouches when it comes to architecture either. 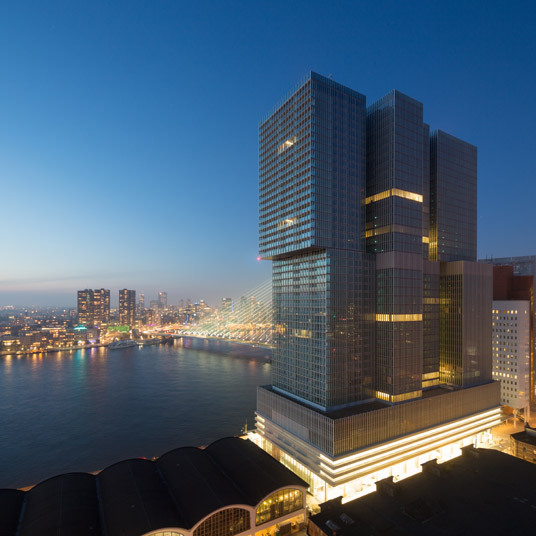 OMA is responsible for the entirety of the De Rotterdam mixed-use development, and for the hotel’s interiors as well — so if there’s a certain unity to the vision, it’s no coincidence. Dutch modern architecture always feels like the future, and this is no exception. It’s enough to make optimists of all of us. Rooms are a marvel of attractive efficiency, which here is not a euphemism — they start out reasonably spacious and sprawl quite outrageously by the time you get to the Horizon Suite. The bar is buzzing, serving cocktails with a view (and a DJ-provided soundtrack), and the kitchen serves global cuisine in an inspired space. There’s a terrace on the seventh floor overlooking the water, and there’s even a stylish little espresso bar for those moments when your enthusiasm outpaces your energy. In lesser hands such a hotel might risk edging into pretentiousness, but there’s no pretending going on here — this is the real deal.